The HangOn headphones come nicely packed in a big box and feel very premium. The packaging comprises of a unique cardboard holder that can practically be used as a stand for the headphones. These are over the head circum-aural headphones and seem very sturdy at the first glance. The large earcups on the outside have Manzana branding and are movable to adjust to varying ear sizes and shapes. Unlike many other inexpensive headphones out there, the HangOn headphones do not feel flimsy. In fact, they feel very premium and are made out of very good quality plastic. The headset is also covered with a leather-like material with cushioning that overall improves the feel of the device. The headband can be extended to suit various sizes and glides securely through each position. It is also padded for additional head comfort in addition to the earcups. The oval ear cups are pretty large and easily cover all sizes of ears. The padding near the cups is soft but unfortunately, feels a bit sweaty after a long usage. Both the earcups have Left and Right labels that help you wearing it the right way. The speakers on the headset are powered by 40mm drivers that are capable of producing decent sound. Based on the different kinds of music I played on it, I've come to the conclusion that music lovers who like clarity and crisp sound would definitely enjoy them. Bass lovers on the other hand, may feel that it could've been a bit punchier. Although they are advertised as headphones with 'deep bass', which they are! But for me, it seemed to be slightly lacking on most of the songs I used this headphone on. That being said, they do not sound flat and have a decent amount of bass. I may sound a bit biased since I love strong bass in my music. As in with all speakers, burn-in for this headset also improves the output capability of its drivers, thereby improving the final sound quality. I did leave them to burn in overnight and they sounded much better the next day. Hopefully, with more usage its drivers would open up and improve even more. Noise cancellation and noise isolation have a single goal; to reduce as much as ambient noise during playback. However, the technology used in both the cases are miles apart. 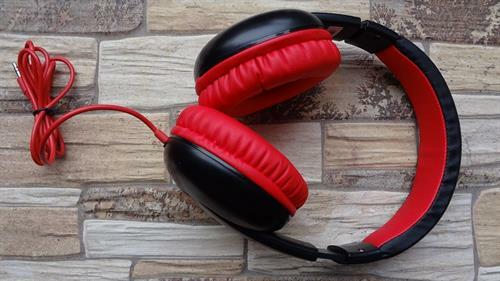 Noise cancellation is in most cases is achieved electronically by making use of external microphones to detect ambient sound or noise and produce an anti-noise signal that reduces the ambient noise. Noise Isolation, on the other hand, is an effort in terms or quality of the product to reduce or isolate ambient noise. This is usually done by using high-quality, sound proof material in the construction of the hard product. The HangOn headphones use good quality ear cushions that work decently well for isolating ambient noise. However, one mustn't expect and compare them with other noise cancellation headphones. The HangOn headphones come in two variants. I was unable to test the microphone quality as the unit I received was a non-microphone version. With a standard 3.5mm headphone jack that is the norm these days, this headphone can connect to almost any portable device out there. Mobiles, tablets, laptops, mp3 players and iPods, it should work perfectly on all of them without the need for any external attachments. The headphone cord is around 1.2 metres long and feels good quality. I would've liked it much more if it was braided or coiled, but that seems a pretty tall order at this price point. My curious mind did not stop me from removing the soft cushions from the ear cups to have a look at the internal speaker and tweeters/woofers if any. To my surprise, I found three tiny dedicated woofers covering the main speaker behind both ear cups. The Manzana HangOn speakers (with mic) are currently priced at Rs. 625 on Flipkart in India and are in-stock. They are sold and shipped directly by Manzana if you order from Flipkart. The pricing on other e-commerce websites is a bit on the higher side. If you have to intentionally look for a weak point in a particular product, it means it definitely is a good one. I only had one little issue with this product. After inspecting the internal speakers and the surrounding woofers by removing the protective soft cushions, it was extremely difficult for me to put them back in place. After trying really hard for a long time, I was able to fit them in place, albeit not perfectly. This may not be an issue for you if you do not remove them in the first place, however, since I did, I had to face this problem. I congratulate Manzana on this great product and hope they listen to the consumer feedback and improve upon this aspect. Having owned and used a plethora of headphones/earphones in the past, I can safely say that the HangOn headphones are one of the best out there if you are looking for one in this price bracket. These are definitely better than some of the overpriced headphones from Sony and Beats. However, if you have a bigger/better budget and don't mind spending more, I suggest going in for the noise cancellation option.